NewsStand, a news aggregator, to access news with a map query interface is an alternative to the linear Google News. Discuss its design and utility with Hanan Samet, Distinguished University Professor at the Computer Science Department at the University of Maryland. NewsStand is an example application of a general framework to enable people to search for information using a map query interface, where the information results from monitoring the output of over 10,000 RSS news sources and is available for retrieval within minutes of publication. The advantage of doing so is that a map, coupled with an ability to vary the zoom level at which it is viewed, provides an inherent granularity to the search process that facilitates an approximate search thereby permitting the use of spatial synonyms instead of being limited to an exact match of a query string. This is predicated on the use of a textual specification of locations rather than a geometric one, which means that one must deal with the potential for ambiguity. The issues that arise in the design of a system like NewsStand, including the identification of words that correspond to geographic locations, are discussed, and examples are provided of its utility. Watch a video interview with Hanan Samet. 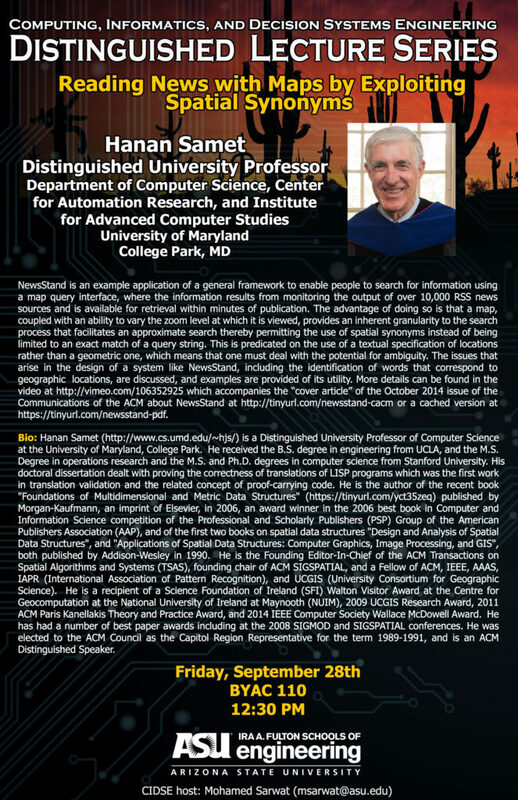 Hanan Samet is a Distinguished University Professor of Computer Science at the University of Maryland, College Park. He received the bachelor’s degree in engineering from UCLA as wells as a master’s degree in operations research and a master’s and a doctoral degree in computer science from Stanford University. His doctoral dissertation dealt with proving the correctness of translations of LISP programs, which was the first work in translation validation and of proof-carrying code. Samet is the founding Editor-In-Chief of the ACM Transactions on Spatial Algorithms and Systems, founding chair of ACM SIGSPATIAL and a fellow of ACM, IEEE, AAAS, International Association of Pattern Recognition and University Consortium for Geographic Science. He was elected to the ACM Council as the Capitol Region Representative for the term 1989-1991 and is an ACM Distinguished Speaker. 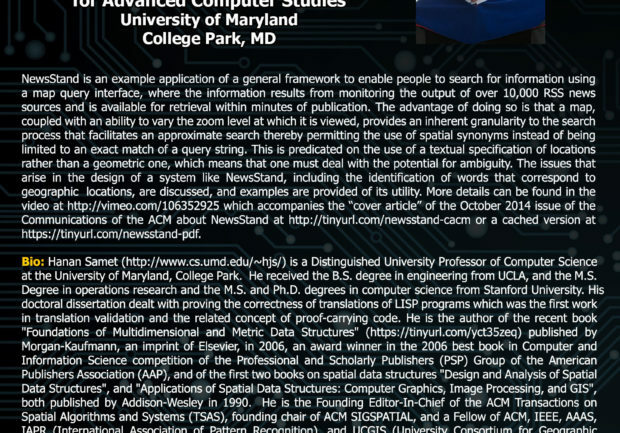 Currently, Samet is a Distinguished University Professor at the Department of Computer Science, Center for Automation Research and Institute for Advanced Computer Studies at the University of Maryland.